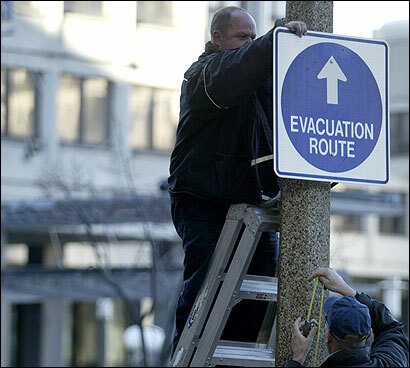 In a test of Boston's ability to handle unanticipated catastrophes, officials yesterday staged a mock evacuation, overseeing the movement out of the city of almost 700,000 people over a three-hour span in the late afternoon. The evacuation was a test of a new $827,500 emergency preparedness plan just unveiled by Mayor Thomas Menino. A team of police, fire, transportation, and health specialists, as well as officials from the MBTA and several other state agencies, had participated in its development, which included new “evacuation route” signs as well mailing brochures to residents detailing emergency procedures. The team spent months identifying a variety of evacuation mechanisms, coming up with a list that included automobiles, buses, subways, commuter trains and even bicycles. For its part, the MBTA stepped up the frequency of public transit vehicles in order to accommodate the crowds seeking to exit the city. Still, subways in particular often arrived at stations full, forcing some evacuees to wait. Many of those interviewed said they had to stand for their entire trip. In addition, local radio and television stations sent helicopters and airplanes flying over the city, reporting on traffic conditions and providing evacuees with real-time information about how best to avoid trouble spots and speed their departure. Police meanwhile directed traffic at heavily used intersections while city tow trucks cleared vehicles from the parking lanes of streets identified as major outbound arteries. Along Route 93 South, state officials created a special “HOV lane” for evacuees who traveled together in one automobile. Three hours later, downtown was virtually empty. Most evacuees said they planned to spend the night in dwellings located in nearby suburban communities before returning to Boston in the morning. Menino, professing to be pleased with the day’s results but vowing that “we can do better,” said he wanted to stage another mock evacuation immediately. “We plan to keep practicing every single day -- excepting perhaps weekends -- until we get this right,” he said. 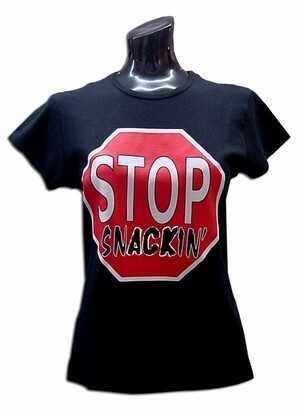 Stunned by an alarming rise in anorexia and bulimia among Boston teens, Boston mayor Thomas Menino demanded that diet centers remove the popular “Stop Snackin’” T-shirts from their shelves. Menino blamed the controversial T-shirts for the sudden rage for extreme thinness that has overtaken the city’s youth. “If it wasn’t for these shirts, they’d be eating three squares a day,” he said. The mayor’s vow to seize the shirts was opposed by the Massachusetts chapter of the ACLU, which called their forcible removal a violation of free speech. Atheist Michael Newdow, who recently sued the US Treasury over “In God We Trust” and has battled against the term “under God” in the Pledge of Allegiance, today filed a new lawsuit aimed at banning any religious references in curses, epithets and other profanities. The suit, filed in the U.S. District Court for the Eastern District of California, seeks an immediate injunction on the use of such language in any government buildings, including, schools, courthouses, state houses, city halls or office buildings housing government workers. The injunction would cover all government employees and any visitors to those buildings. “If people want to swear, there’re plenty of options open to them,” Newdow continued. “Bodily functions, sexual acts, scatology -- pretty much anything is acceptable. What is not acceptable is to mix religion and cursing while on government property.” Newdow also asked in his suit that commonly used euphemisms -- such as “Goldarn” or “G-D” -- also be prohibited. “Everyone knows those are simply waffle words for genuine profanity” he said.